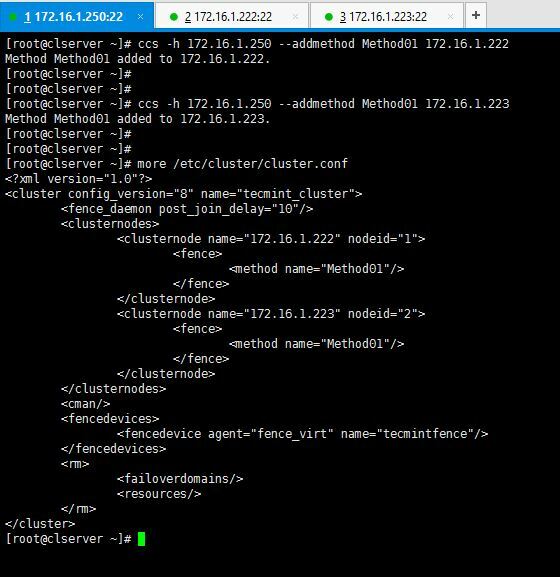 In the previous two guides, we’ve discussed how to install cluster, creating a cluster and adding nodes to the cluster, also we’ve studied how cluster.conf appears to be after the necessary configurations are done. Today, in this third part of clustering series, we are going to discuss about what is fencing, failover and how to configure them in our setup. First of all let’s see what is meant by Fencing and Failover. If we think of a setup with more than one nodes, it is possible that one or more nodes can be failed at some point of time. So in this case fencing is isolating the malfunctioning server from the cluster in order to protect and secure the synced resources. Therefore we can add a fence to protect the resources shared within the cluster. Imagine a scenario, where a server has important data for an organization which the stakeholders need the organization to keep the server up and running without any down time experienced. In this case we can duplicate the data to another server (now there are two servers with identical data and specs) which we can use as the fail-over. By any chance, one of the servers goes down, the other server which we have configured as the fail-over will take over the load and provides the services which were given by the first server. In this method, users will not be experienced the down time period which was caused to the primary server. As we’ve already discussed about our testing environment setup in last two articles, that we’re using three servers for this setup, the first server act as a Cluster server and other two as nodes. 1. 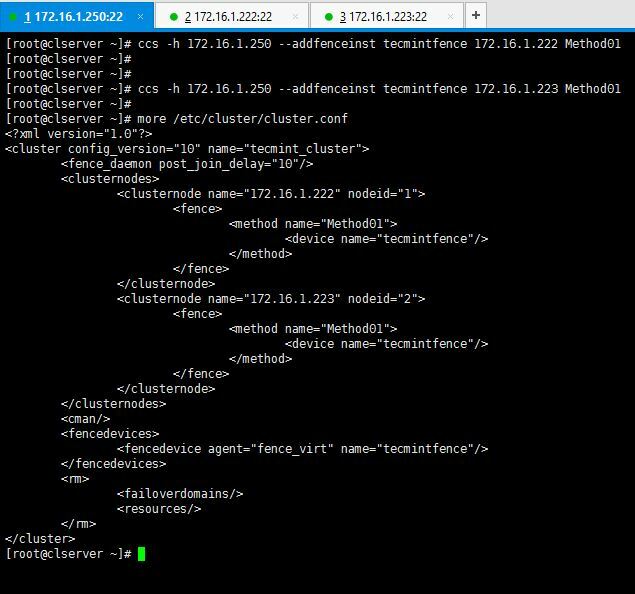 First we have to enable fencing on the cluster server, for this I will use below two commands. 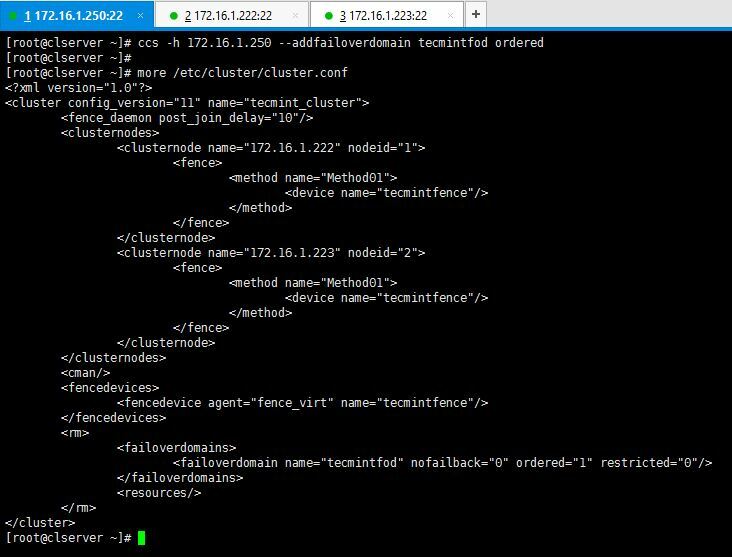 As you can see we use ccs command to add the configurations to cluster. Following are definitions of the options I have used in the command. -h: Cluster host IP address. –setfencedaemon: Applies the changes to the fencing daemon. post_fail_delay: Time in seconds which the daemon waits before fencing a victim server when a node has been failed. post_join_delay: Time in seconds which the daemon waits before fencing victim server when a node has joined the cluster. 2. 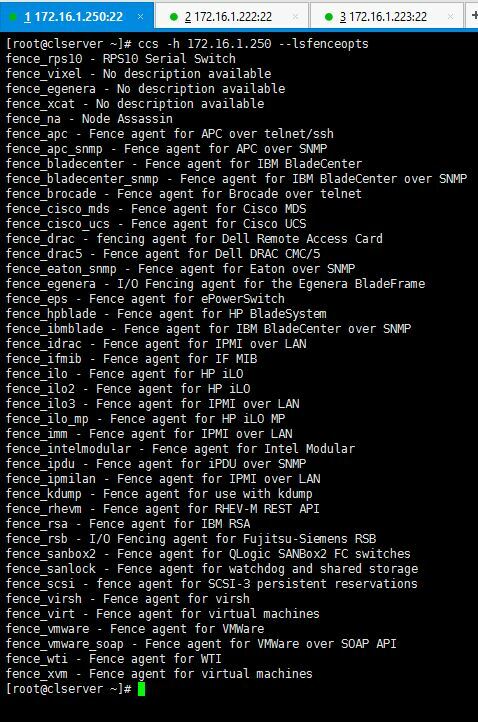 Now let’s add a fence device for our cluster, execute below command to add a fence device. This is how I executed the command and how the cluster.conf file looks like after adding a fence device. You can execute below command to see what kind of fence options you can use to create a fence device. I used fence_virt since I use VMs for my setup. 3. Now I’m going to add a method to the created fence device and add hosts in to it. You have to add the methods you have created while ago for the both nodes you have in your setup. 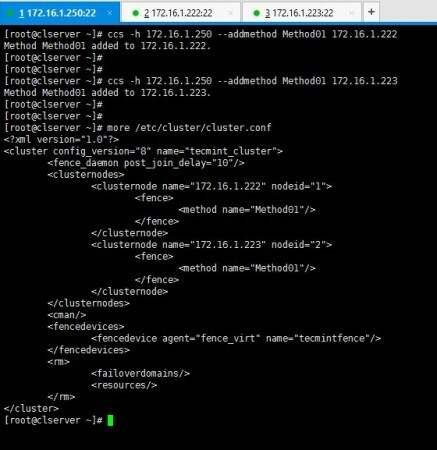 Following is how I added methods and my cluster.conf. 4. As the next step, you will have to add the fence methods you created for the both nodes, to the fence device we created namely “tecmintfence”. I have successfully associated my methods with the fence device and this is how my cluster.conf looks like now. Now you have successfully configured fence device, methods and added your nodes to it. 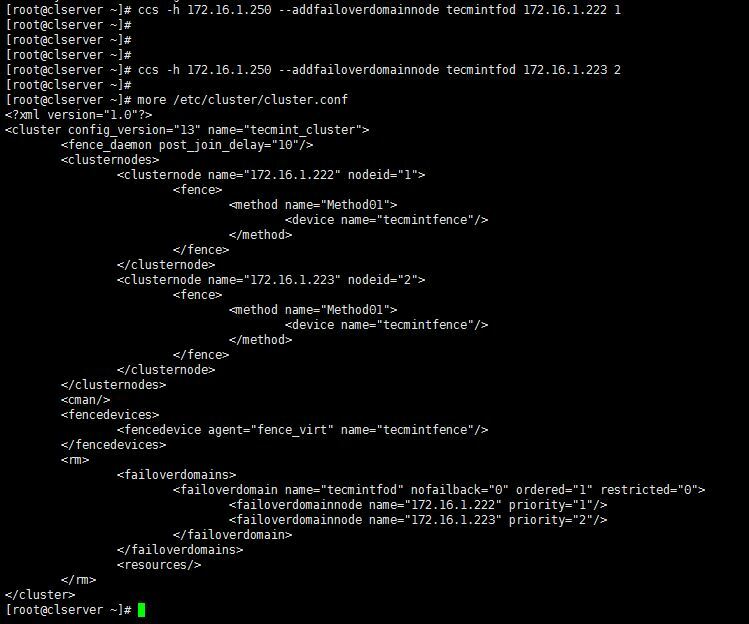 As the last step of part 03, I will now show you how to add a failover to the setup. 5. I use below syntax of commands to create my fail-over to the cluster setup. 6. As you have created the fail-over domain, now you can add two nodes to it. 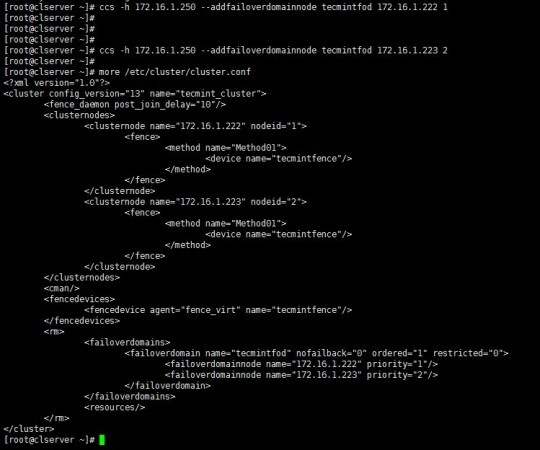 As it is shown above, you can see cluster.conf bears all the configurations I have added for the fail-over domain. Hope you have enjoyed the Part 3 of this series. Last part of the Clustering guide series will be posted soon which will teach you to add resources to the cluster, sync them and start-up the cluster. Keep in touch with Tecmint for the handy HowTos. can we use this article to setup cluster in centos 7 ? Thanks Vinay. Ofcourse you can. Thankyou so much for your response but using this article we are not able to setup cluster on centos 7 becuase of package difference and there is lots of different in configuration as well. Vinay, Your question has been raised by another user in Part two. RHEL/CentOS 7 have deprecated the packages I’ve mentioned in the article. But that doesn’t mean you cannot do this in RHEL or CentOS 7.You can use corosync, pacemaker and pcs instead. Thank you so much, this post gave me a better knowledge about clustering than thousands writing out there. However, I still wondering what fence options you can use to create a fence device if you used real machines for your setup? And, what is the point of method in fencing? Can you please put more explanation or references resource that I can work to understand them? Again, thank you so much for your work. Thanx for nice comments. I don’t really understand what you have meant by “real machines”. If I’m correct you’re referring to physical machines other than VMs. If so, it doesn’t really matter it being a VM or a physical machine to set these configurations up. 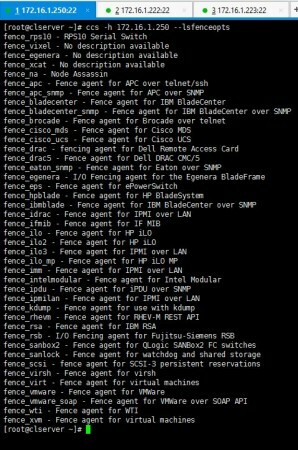 You can use the command “ccs -h –lsfenceopts” to view the fencing options you can use. Fist of all, thanyou very much for this article…it so much helpfull. i can´t find the Part4 and…can you post the lisnk pls. PS, sorry for my english. No worries Ariel. Here it is. Thanks for providing this valuable document. awaiting for your next post. You’re welcome. Will let you know when the last part is out. The concept of clustering had always baffled me. However, this tutorial has cleared up all my doubts. I am waiting for your last post for this serie. I hope you will post it soon. Thank you so much for all the parts ( Linux clustering with two nodes).I like the way it was explained very systematic step by step. waiting for its last part and final part with resource such as webserver,NFS etc. Thank you very much. Last part will be posted soon. Thank you so much my friend for this third part. 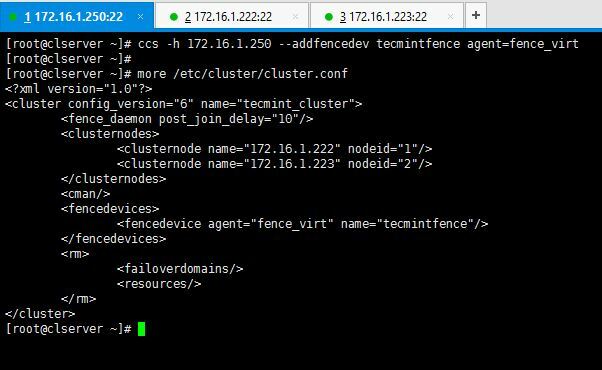 I have a question: I tried to set a fence virtual device in a virtual environment, but it doesn’t work for me, in some part of my configuration the node doesn’t come back to the cluster after a failure. So i have added a quorum disk, and finally my cluster works ok (the node goes down and after the failure come back to the cluster), so my question is: what is the difference between a fence device and a quorum disk in a virtual environment? First of all you should know that a quorum disk is more useful in clusters which contains lesser nodes than a multiple node cluster which in case of a node fails. But of course having a quorum disk in any cluster would be great for its well being. In your case, what you have gone through is identified as a “fencing war” in the tech world. What i will do is, I will post a new article about the scenario you have faced in near future. It will answer all your questions and will help to understand more about fencing and quorum disks. Will put a comment here when the article is ready or send me your email and i will inform you. Thanx for your interest and nice comments. Thank you very much for your new post about clustering. I am very much enjoying and waiting for your next post. I would like to request you that if you may have time then please make a series about “Redhat OpenStack”. Actually the world is now moving towards “Cloud Technology” and now we have to learn those cloud technology.